Despite being largely the same car as before, Nissan never fails to find a way to make these big fast beasts even faster. Nissan introduced the Track edition of the GT-R in 2016 with adaptive dampers, race-inspired aero, and a stiffer and lighter chassis, but it was saddled with the “base” GT-R’s 562 horsepower. This year the Track edition will be imbued with the NISMO powerplant, good for 600 horses even. There is also a new optional carbon fiber roof and new optional carbon ceramic brakes (in 16.1" front and 15.3" rear sizes!!!) to decrease weight a few more pounds, though Nissan doesn’t specify how much. 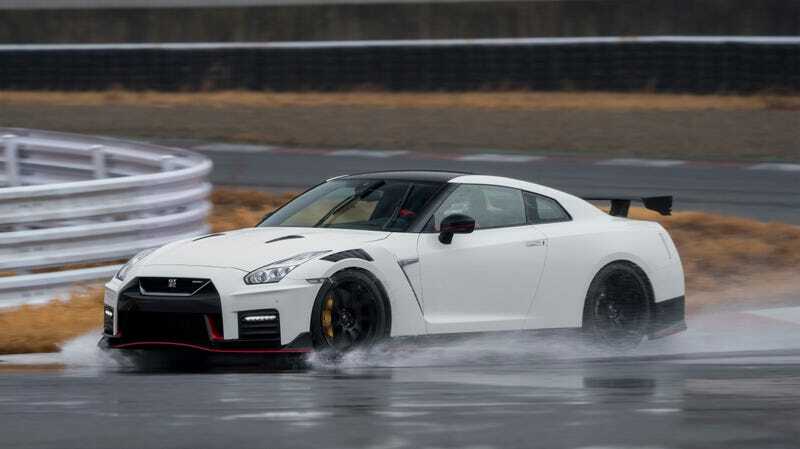 The GT-R NISMO, shown here in the glorious rain photos, does not get any additional horsepower, sticking with that same 600. The engine does get a pair of newly designed turbochargers straight from the GT-R GT3 race car which are intended to spool quicker, but provide the same level of boost. Where the Track edition is intended to be lightweight, the NISMO takes that ethos to the next level with carbon bumpers, fenders, roof, hood, rocker covers, trunk lid, and wing. In all, the new carbon parts reduce the weight of the NISMO by 23 pounds. Additional pieces within the car have been reduced in weight by another 44 pounds for a total 67 pound weight removal over the 2019 version. The new RAYS aluminum wheels are part of that weight loss package, as they are said to be stiffer and lighter than before. These wheels hold a new Dunlop tire for the NISMO, which has an 11% increased contact patch thanks to fewer and wider tread blocks and an overall wider tire tread. Nissan has also updated the programming on the suspension and the 6-speed dual clutch transmission, updated the titanium exhaust, and enlarged the car’s brake rotors. Most of the uninitiated will never be able to tell the difference between a 2019 and a 2020 Nissan GT-R NISMO, but the easiest way to tell is also the coolest part. The new front fenders feature a bare carbon scallops to evacuate air under the front of the car, increasing downforce. Pricing hasn’t been announced yet, but Nissan charges $128,540 for the current Track Edition, and $175,540 for the NISMO. Deliveries will begin this summer.